At first glance your tile may look like it doesn't need to be cleaned. But if you take a closer look you may be surprised at what you find. 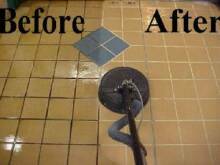 Not to worry, Custom Maid Cleaning Services has the tools and equipment to bring that dingy looking tile back to new. We use a high pressure water extraction system that blasts the dirt and grime. Our system gets in all the crevices of your floor so there's no place for dirt to hide. 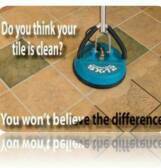 Give us a call and we'll come out and give you a free cleaning consultation on your tile floors. Pricing: Cleaning only: $.30 per sq. ft.
Clean and seal: $.60 per sq. ft.
Clean, seal, color: $.90 per sq. ft.